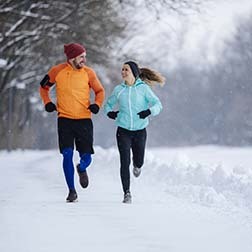 Dress in layers that you can remove as soon as you start to sweat and then put back on as needed. First, put on a thin layer of synthetic material, such as polypropylene, which draws sweat away from your body. Next, add a layer of fleece or wool for insulation. Top this with a waterproof, breathable outer layer. Check weather conditions and wind chill. Health risks increase when the combined temperature and wind chill falls below -20°F. Know the signs of frostbite and hypothermia, and don’t ignore them. Schedule exercise into your appointment book the way you would an important meeting or social event. Set the time for it and then make no excuses about keeping it. And, please don't use your age as an excuse to avoid exercise, because no matter what your age, exercise can provide enormous benefits for your health. As a matter of fact, if you happen to be over 40, it's especially important to either start or step up your exercise program. This is the time of life when physical strength, stamina, balance and flexibility start to decline, and exercise can help to counteract that dramatically. If outdoor exercise is not an option, (or just doesn’t appeal to you) consider indoor choices at home or a fitness facility. Good luck with your exercising journey!